Some years ago I had an idea: to see if it would be possible to fit a selection of tools in a Pelican 1550 case comprehensive enough to handle virtually any field repair on a vehicle—from simple tasks such as replacing a radiator hose up to major operations like removing a transmission or swapping out suspension components. I documented the process of trial and error in several magazine articles and a series on Overland Tech and Travel. Once sorted, the One-Case Tool Kit performed as well as I had hoped. I was rarely stumped on having the right tool for both my own work and that of others, although a couple of gentlemen of British origin who will remain nameless still rib me about a single failure to produce an 8mm hex bit, because the hex bit set had been purloined for a task and not returned (annoyingly, by me). Despite its success, the OCTK had an issue: weight. At 62 pounds all up it was not the easiest thing to carry or secure, and for many, if not most, tasks the exhaustive and tightly packed assortment was simply overkill. Roseann took to referring to it as the One-Hernia Tool kit. Ha ha. Not that she minded me fixing stuff with it. So for some time I’ve been musing on a sequel, which for now I’ll call the OCTK Lite. This one is not intended to be comprehensive. However, my hope is that it will suffice for a majority of regular maintenance tasks and light repairs, and will be light and compact enough to be carried and secured easily and accessibly. The first decision to be made was regarding the container. I decided not to go with a smaller version of the 1550 Pelican case, partially because the Pelican, for all its toughness and weatherproofness, is pretty heavy for the volume, and partially because I just wanted to try something different. So this kit will be going into a Blue Ridge Overland Gear Tool Bag, a zip-open Cordura bag that cleverly incorporates six individual zippered pouches, each of which secures inside the bag with a Velcro strip. Thus if, for example, you just need the ratchet and socket set for a particular job, you can rip that pouch out of the bag and take it where needed. 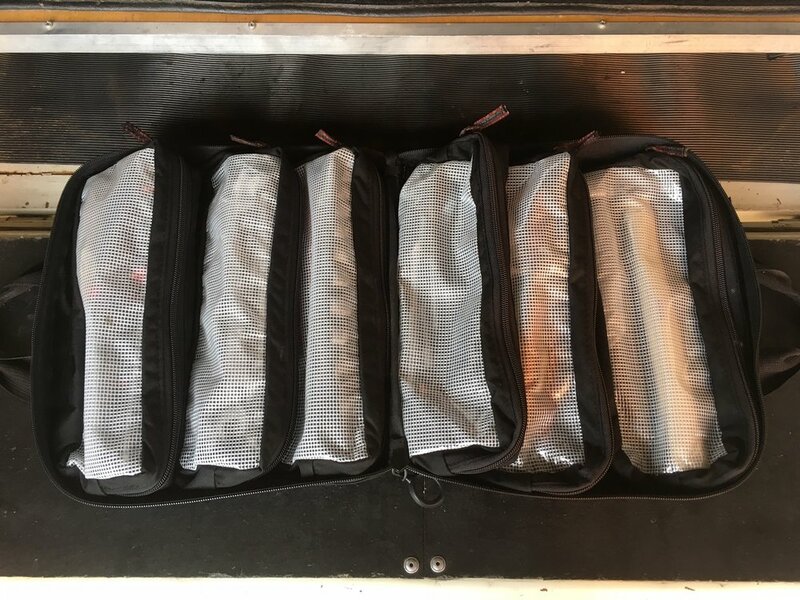 Like all Blue Ridge products, the Tool Bag is made in Virginia, and the quality is absolutely first-rate (they’ve been making the attendee bags for the Overland Expo for several years now). One side of the exterior has a pair of mesh pockets that would be good for holding nitrile gloves and/or a tube of hand cleaner; the other side has a suite of Molle-style loops if you'd like to attach a small external pouch (or they will hold frequently needed tools such as screwdrivers or pliers), and a Velcro panel where to which you can stick your tactical Snap-On patches. We'll investigate what’s going inside the bag in the next few weeks.